Bernie Sanders, the self-proclaimed democratic-socialist senator from Vermont and 2020 presidential candidate, announced his Medicare for All plan Wednesday. 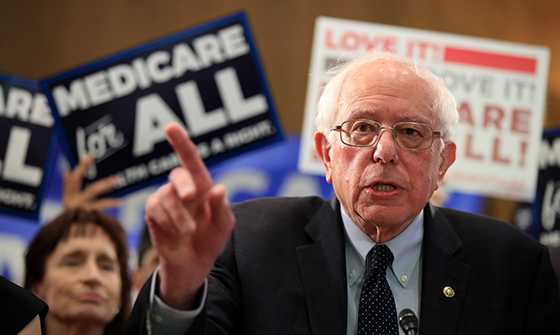 In a crowded meeting room in the Dirksen Senate Office Building, flanked by two U.S. flags and in front of a banner that said, “Health Care is a Right,” Bernie laid out his plan to completely scrap employer and private health insurance and replace it with a single-payer, government-run health care system. The currently-acknowledged cost – which we all know from experience with previous grand government social welfare schemes will prove to be grossly understated – runs to some $35 trillion over ten years; or roughly $3.5 trillion per year. For some perspective, the entire federal revenue budget for fiscal year 2019 is $3.4 trillion. And that staggering sum is still not enough to cover existing spending. To keep the bureaucrats paid and the lights turned on, the government will need to borrow another $900 billion. There are two problems here. The first is the cost. The cost alone would kill this lunacy but for the fact that the number is so huge, it is beyond comprehension. Americans have become so numb to the massive sums thrown about in discussions of federal spending that citing the cost of any federal program has little measurable impact even on nominal fiscal conservatives. It isn’t. Trying to adopt the British model here would be catastrophic. The UK has one-fifth the population of the U.S. spread over one-fourth the land area. Scaling their system up to cover 320 million people flung across an entire continent would be a disaster. An article this week in the Times of London details how tens of thousands of older Brits are going blind from cataracts as they suffer the National Health Service’s rationing of cataract surgery. As challenged as our health care system is, you nevertheless don’t hear similar stories here. Here, you can have cataract surgery within a week for the price of a modest car payment. It has been true since the establishment of the National Health Service in 1948 that no matter how much Parliament appropriates for it, it is never enough. The health care that Brits don’t pay for with cash they pay for with time – time spent waiting on care that is severely rationed by government bureaucrats. No, Bernie, health care is not a right. Nor is it a privilege. It is a service like any other important service. Somebody has to pay for it.